Home Differences What is the Difference Between Ledger and Trial Balance? Although ledger and trial balance are both integral parts of the same accounting cycle, there is still a considerable difference between ledger and trial balance. They both have their respective relevance and timing in the business cycle. In short, a ledger is an account wise summary of all monetary transactions, whereas a trial balance is the debit and credit balance of such ledger accounts. Traditionally a ledger was prepared in a physical book with a separate page for each account and a trial balance was derived from these accounts. In the modern days, all the data is stored in ERPs with the help of computers. A ledger is an account wise summary of all monetary transactions maintained in a classified form. It is a statement of debit and credit balances that are extracted from ledger accounts at a specified time. It is also known as the principal book of accounts and book of final entry. There is no formal synonym of a trial balance, however, it is informally referred to as TB. Ledger acts as a foundation to create a trial balance for the business. Trial balance acts as a foundation to create financial statements for the business. It is essentially a summarized form of all journal entries. It is essentially a summarized form of all ledger accounts. Details of what is a ledger and a sample format are also provided here. Details of what is a trial balance and a sample format are also provided here. There are different types of ledgers such as Debtor’s ledger, Creditor’s ledger, General ledger, etc. There are no subtypes of a trial balance. An adjusted trial balance is made to fix partial & improper transactions. Stage Within an Accounting Cycle. 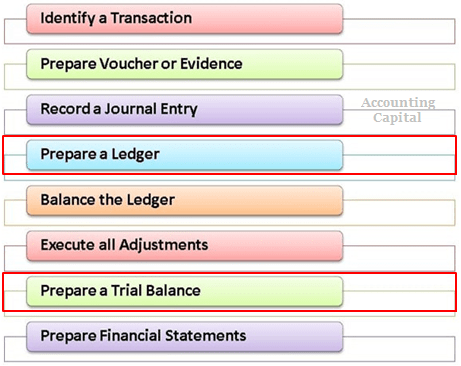 Ledger – It is prepared after recording journal entries, consequently, it acts as a support to prepare the trial balance. Trial Balance – It is the next step after adjusting and closing the ledger accounts, therefore acting as the groundwork for the preparation of financial statements.